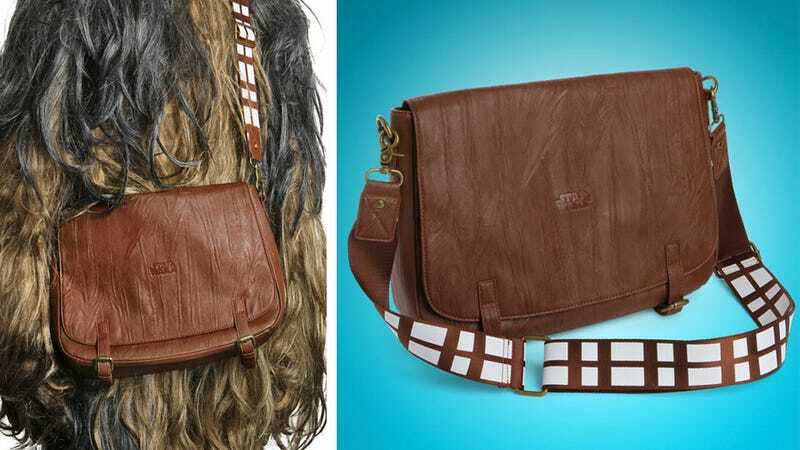 Is a Chewbacca Messenger Bag the Best Thing Lucasfilm Ever Licensed? Out of the way Chewbacca hoodie and every single pointy object that's ever been designed to look like a lightsaber. This officially licensed Chewbacca messenger bag is the best thing Lucasfilm has ever approved since The Empire Strikes Back. Instead of being covered in faux fur that will attract all kinds of fuzz and crap, the bag is made from faux leather embossed with a tiny Star Wars logo on the main flap. But the real piece-de-resistance is the bag's nylon strap which is silkscreened to look like the ammunition bandolier that Chewbacca wore in the films. Just keep in mind that for $75 you're not getting a Wookiee-sized carry all. The bag is only big enough to carry an 11-inch MacBook, a few pens, and maybe an Ewok or two.